Galbraith Bros. Ltd - Precision Engineering in Sevenoaks, Kent. Galbraith Bros (Precision Engineers) Ltd can design, manufacture and deliver on-time production tooling, fixtures and special purpose machinery. Using modern conventional and CNC machine tools we can also manufacture and supply small to medium batch precision components. A significant proportion of our work involves the design and construction of special purpose machinery and fixtures for process automation or product assembly. We are conversant with compressed air pneumatic systems using programmable logic control (PLCs) supported by allied electrical and mechanical services. For heavier duty or hazardous applications, non-electrical or hydraulic systems can also be considered. Traditional press-tool making is not dead. 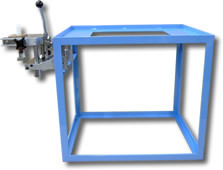 Whilst there is stiff competition from overseas there is still a need for tooling designed and constructed with skill, expertise and using quality materials and hardening techniques. We also specialise in Tabbing Dies (Knives) for stationery divider and tab index manufacturers for E-Z and Scott type machines. 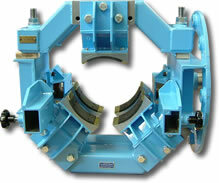 A fast turnaround regrinding service is also offered for Tabbing Dies and other tooling. The design and manufacture of ‘jigs and fixtures’ is the staple means of the easy, safe and precise assembly or process of many of our customers’ products. Again, a fast turnaround and the ability of our customers to rely on us results, in many cases, in blue-chip clients using us as their only manufacturing source. We can liaise with your in house design team or provide our own input to achieve assembly techniques that are speedy, accurate and above all compliant with current Health & Safety legislation. Allied services for the above include heat treatment processes (including vacuum), electro plating, anodising, stove enamelling and powder coating and is carried out by sub contract to approved and where possible local specialist companies. Our company offers a bespoke but broad range of toolroom facilities including surface and cylindrical grinding, conventional machining, milling and turning, sawing, welding and brazing and allied processes. This gives us the ability to machine precise components in a toolroom environment – again with the ability to shorten lead times for prototype, breakdown or for other urgently required items. We also have a sister company on the same site that provides a high quality and flexible CNC machining service and are therefore able to offer the ongoing batch manufacture of precision components for the medical, aerospace, surveillance and automotive sectors from most materials including aluminium alloy, plastics, steel, brass and stainless steel. The company is a BSI registered Company to BS EN ISO 9001:2000 - scope is 'Sub-contract Precision Engineering'. Please contact us with your enquiries or for an initial discussion – we can accept drawings in most digital formats.